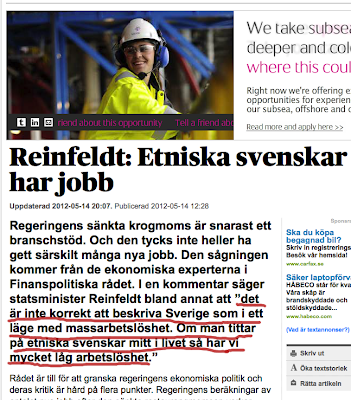 Professors blogg: Only "Ethnic Swedes" Relevant For PM Reinfeldt? 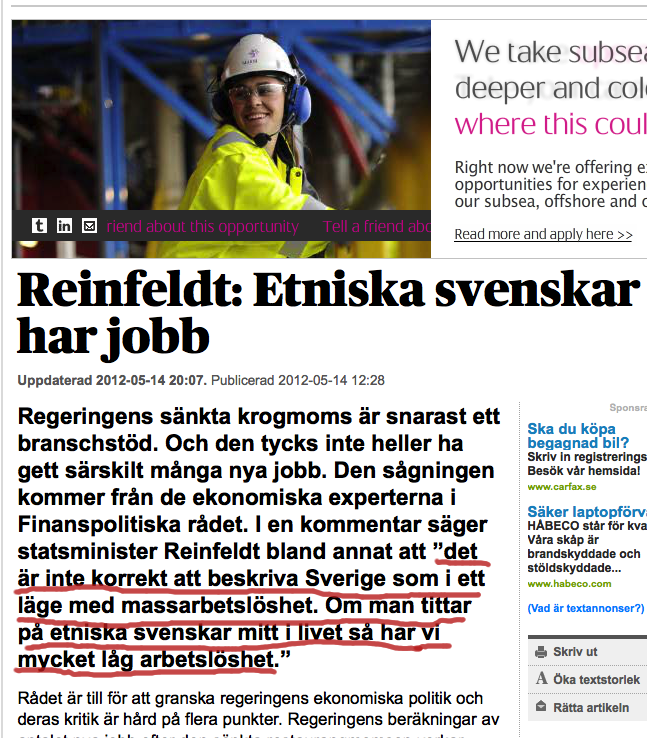 Only "Ethnic Swedes" Relevant For PM Reinfeldt? 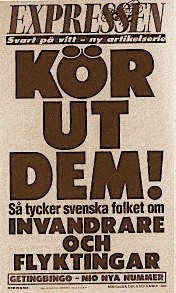 In real terms, the leading right-wing conservative party in the Swedish Government (the Moderates) to which PM Fredrik Reinfeldt and ministers Carl Bildt, Tobias Billström, Beatrice Ask, and Lena Adelsohn Liljeroth belongs, has no different stand on the Immigrant issue than that one of the far-right Sweden democrats. The difference being that the Sweden democrats stands honestly and publicly for their points, whereas Reinfeldt, Bildt & company do not. 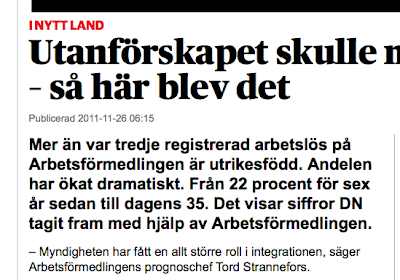 The unemployment rate for foreign-born immigrants in Sweden has increased from 11,2 in 2006, to 14,8 in 2012. Whereas for for native-Swedes the increase has been minimal in the context, from 3.3 to 3.8. Further, the participation possibilities of immigrants in the cultural and political life of Sweden are anything but prominent. Official “Integration” policies seldom leave the desks of governmental offices or the good wishes of one or another personality. A conservative sentiment of “us” and “they” is reputed to be rather strong among many Swedes. Added that to the discrimination exercised against immigrants with respect to work issues or in a variety of societal spheres, a result of it is that the presence of immigrants in Sweden tends to be “hidden” from the eye of the public as well the media, etc. "For how long one has to wait before the economy will be stimulated? Up to ten per cent unemployment? Nowadays there is an unemployment rate, which you described in 2006 as "mass-unemployment". The claiming for total or partial restrictions in the immigration of foreign-born individuals, even if they would be from poor countries or countries of the Third world, is not per se to be considered "cultural racism"; for those positions may very well correspond to a political stand, or views on Immigration policies regardless the issues of race or foreign-culture. In both cases such endeavours are part of the open forum in a democratic society. On the other hand, cultural racism is another thing. And it is in fact a deception covering a biological racial position, a deep racist feeling, or ethnic prejudices against selected national groups. Thus, cultural racism is the manifestation of an intentional political fraud of its proponents or in certain cases the product of a sub-conscious affective state: i.e. the cultural racist will not or cannot acknowledge his real ethnic racism. My point with the factual illustration in the text given in a previous post is - so far - that the argumentation related to foreign-status (i.e. foreign-born individuals as such) as the main criteria to oppose migration or improve the conditions of the immigrant population of Sweden is NOT tenable. Behind pseudo arguments such as foreign-status versus "the real meaning in being Swedish" and different cultural related issues (such as "manners", dress-code and others of the like) there are real determinants at stake which have not been yet clearly identified, possibly not even by the so called "ethnic-racists" or the "cultural-racists" themselves. With this said, I do not dispute that the followers of the different emerging aggrupation within the Swedish far-right might have clear ideas what changes they would like society to implement on behalf of their ideology. They also have their argumentation on why they want those changes. What I say is that it is not always clear why they want those changes to take place. Again, I am not referring to the reasons or fact-arguments given for the proposed changes. My query refers instead partly to the motivational and ideological issues at an individual level, and partly to the social-psychological factors underneath the apparently growing cultural racism in Sweden. Yet, there may be other psychosocial mechanisms behind processes considered as political. This is the case of the conceptions around "trends", "popular", or "fashion" in political views. This happens when "common people" in a given society, by first attributing superior economic values to another society they perceive as "stronger" (the model), ends by copycatting or imitating social behaviours and cultural behaviours they identify as characteristics of the model society. In fact the above is also a "cultural" process subjected to manipulation. The commons in the end consume the culture and the values decided by the establishment according to the rulers’ own strategies of international alliances - often in benefit of their political (and economic) interest. This would entail the cooperation in economic, military, geopolitical, and other levels. In concrete terms, the machinery appointed by the establishment, by those in the cultural power, implements the “ideologization” task. That is why they are there. "The public"attitudes against immigrants of Arab origin and Muslims. "That's the way the Swedish people thinks about immigrants and refugees". One clear illustration is given by the current attitudes of "the public" against immigrants of Arab origin and Muslims. We cover this as a religious, or cultural, or political or whatever matter, inclusive "a matter of taste". 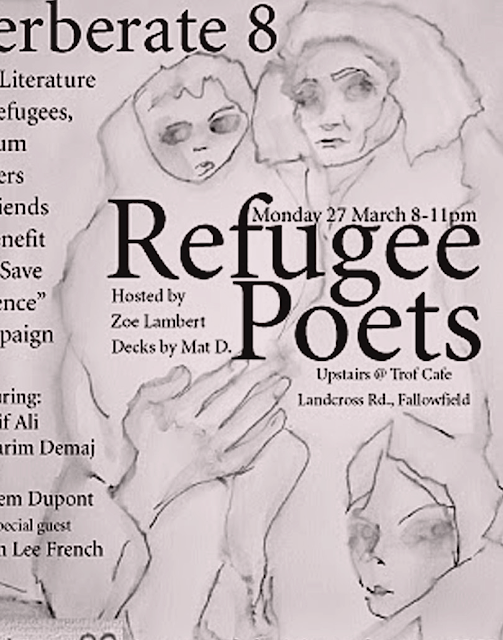 In fact those who regard them as undesirable do so because they have been culturally educated in the last twenty years or so (in fact, since the first oil-motivated USA invasion in Irk, early nineties) to associate these people with terrorism, jihad, "anti Western" militant behaviour, or whatever undesirable attribute. The political points that nowadays the emergent far right is scoring in Sweden are a consequence of this psychosocial manipulation with the public at large resulted of the political and military alliances between the Swedish establishment and NATO. Hur länge ska man vänta innan man stimulerar ekonomin? Till tio procents arbetslöshet? Det är nu en arbetslöshet som ni beskrev som massarbetslöshet 2006. - Det är inte korrekt att beskriva Sverige som i ett läge med massarbetslöshet. Om man tittar på etniska svenskar mitt i livet så har vi mycket låg arbetslöshet. Vi beskrev då (2006) ett vidare utanförskap som handlade om att en stor del av de som var i arbetsför ålder, men som inte jobbade, inte beskrevs som arbetslösa. Och utanförskapet har minskat, säger Reinfeldt.